knitty dreams: My First Ravelympics! 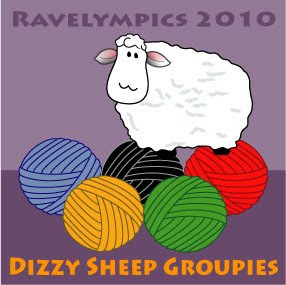 For those of you out there who don't know what the Ravelympics are, it is when all of us knitters and crocheters on Ravelry knit our fingers sore during the Olympic Games. This time it's in Vancouver, Canada during Feb 12-28, 2010. The goal is 2 weeks of focused team challenge knitting while watching the actual Olympics unfold before our eyes. I am part of Team Dizzy. GO TEAM!! This is my first Ravelympics and I am so excited! I decided to make something for my mother after she called me to say she had just bought a hat to keep her head warm this winter. That made me feel like DIRT! Here I am a knitter and my mother is buying a noggin warmer! She loved the Star Crossed Berets that I had made for myself and my sister, so naturally she wanted one too. So I am making that slouch hat and a matching cowl, inspired by the hat pattern, for her. I am using some of my Dream in Color Classy from the stash. Thou, my mother loves pink as much as I do, she wanted something different. I thought the Cloud Jungle would be a lovely color for these two projects. I feel like I can complete these two projects over the next two weeks. On top of caring for my family. 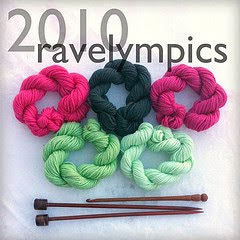 So good luck and happy knitting to all of my fellow Ravelympics 2010 Winter Games crafters.